Fig. (3) (Color online) Upper panel: Global record G7 (grey), running 31-year average of G7 (blue), sine representation of G7 with three sine functions of the periods 1003, 463, and 188 years (green), with four sine functions including the period ~60 years (red), continued to AD 2200. The parameters of the sine functions are given in Table 3. The Pearson correlation between the 31 year running average of G7 and the three-sine representation (green) is 0.84, for the four-sine representation (red) 0.85. 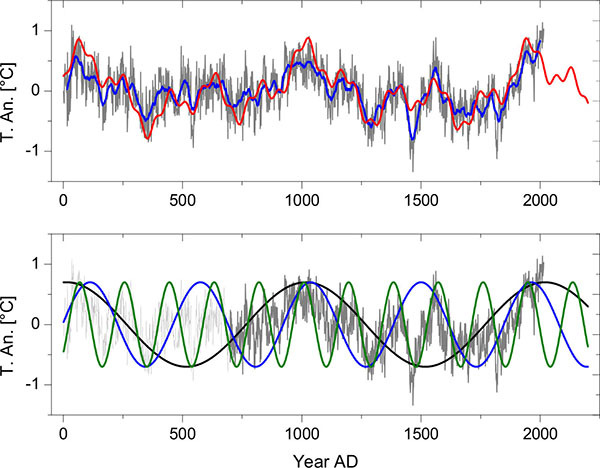 Lower panel: G7 (grey) together with the sine functions of 1003, 463, and 188 - year periods continued until AD 2200 (equal sine amplitudes for clarity).